India’s newly elected Prime Minister Narendra Modi has clearly indicated that the 13th Amendment to Sri Lanka’s Constitution should be “optimally” implemented, according to Prof. Tissa Vitharana, Senior Minister for Scientific Affairs and chairman of the now-defunct All Party Representative Committee (APRC). Speaking at Thursday’s Sunday Times Business Club (STBC) discussion on the “Indian polls impact on Sri Lanka” at the Cinnamon Lakeside hotel, Prof. Vitharana added that Mr. Modi “wants the Tamil community to be given a solution to the national question which would accord with their sense of dignity and their satisfaction to work within one Sri Lanka”. 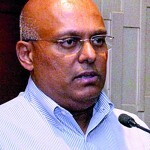 “I would say that this is something that is very clear from what has transpired so far… And therefore it is up to us in Sri Lanka to take very positive action to solve the national question, to have an effective selectability process in parliament where all the relevant stakeholders are participating and that there is a genuine discussion to work out a political solution to the national question. The LLRC report and proposals need to be better implemented and the northern provincial councils should be more effectively made a part of the development process,” he said, adding; “So we’ve got to put our house in order” if Sri Lanka is to expect India’s support. 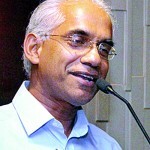 Eran Wickramaratne, Opposition (UNP) MP and former banking sector, cautioned against any positives from the MODIFICATION (Modi) factor in Sri Lankan politics and also noted that, contrary to belief, the Congress Party (and the Gandhi’s) are not down and out. “The bilateral discussion that took place between India and the Sri Lankan delegation on the sidelines of Prime Minister Modi’s inauguration had already included his government expressing its concerns regarding the implementation of the 13th Amendment, or 13th Amendment plus,” he said, speaking as one of the panellists at the forum which was also attended by two top officials from the Indian High Commission. He also warned that security was of vital concern to the new government, commenting that with Sri Lanka being so close to India, in fact just a few kilometres away, the island nation’s foreign policy was closely tied to its neighbour’s security. He also recalled the incidents of 1987, when the so-called Indian Peace Keeping Force (IPKF) entered Sri Lanka, a reminder of another possible way the situation could play out if Sri Lanka continues to be a concern. 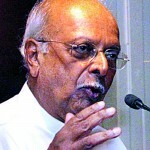 However, he also shared the sentiment, which was also agreed upon by Prof. Vitharana and Ceylon Chamber of Commerce Chairman Suresh Shah, the other speaker at the panel discussion, that should Sri Lanka deliver on the political front, in terms of the implementation of the 13th Amendment to the Constitution, as well as negotiating more devolution of power in a way it does not compromise national security, then the island could build an even stronger relationship with India, which was widely expected to become the world’s second largest economy one day. On the other hand, he stated that Sri Lanka was “dreaming” if it imagined that it could do this without a resolution to the national, political question. Meanwhile, Mr. Shah noted that Prime Minister Modi’s style of economic leadership in Gujarat had created a lot of business confidence in the future of India, and was shortening its trajectory to take its place as the second largest economy in the world. He also made particular note of India’s abstention at the UN Human Rights Council vote on Sri Lanka, indicating that it was particularly noteworthy since the government at the time was unsure of its success at the polls, where Tamil Nadu state support would have been necessary. He also referred to the tremendous potential Sri Lanka would have in exports by tapping just a fraction of India’s 1.2 billion marketplace. The monthly meeting of the club was hosted by the Cinnamon Lakeside while Commercial Bank came in this week as the club’s newest sponsor.